this one is also for Our World Tuesday and every one else. Hope all of you in the USA on the northeast coast will be safe and warm during coming storm. Rain and Wind are bound to wipe out most of the beautiful foliage. So hope you enjoy this photo above. Wishing you the best in every day. I loved the macro image ... beautifully clicked !!! Love the Halloween sketch, we're all about the pumpkins today here! lovely Halloween sketch, your Haiku's are so much more noticeable on these lovely backgrounds! cute sketch. love the photo with the sand and water, too! Hope you have a Happy Halloween! 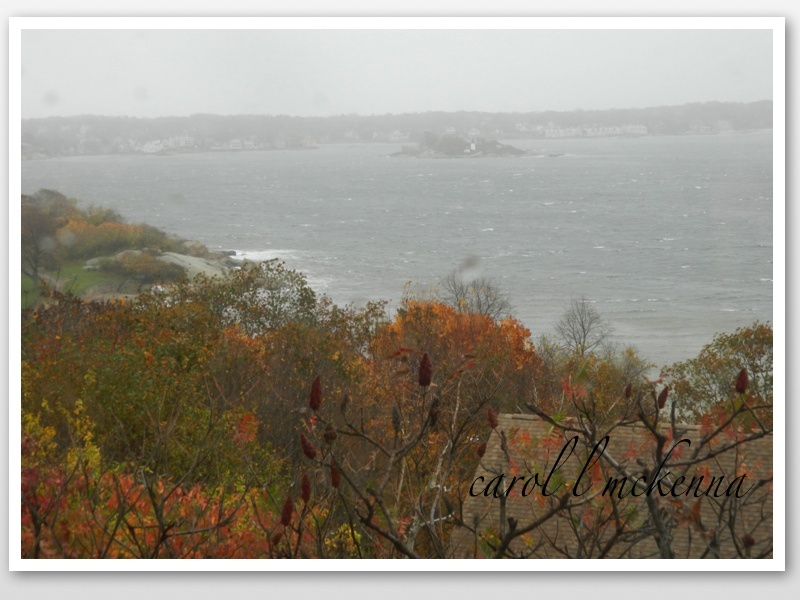 Hope Sandy doesn't hit the coast as hard as the weather people are predicting. I also liked the macro beach photo - all those lines are intriguing! I love the colour and joy radiating from our pumpkins! Wow... so many to absorb. All interesting and creative. I'm drawn to mother natures design in the sand. It's priceless! Wow! Carol what a treat this post. I like your haiku on flying very much. Your great. Fun Halloween piece, great pics, the sand one is very cool! The beach sand pic has really made me wonder-struck! Its so beautiful! I love reading your quotes and the haiku pages look awesome! wow the second photograph is stunning, just stunning. The ocean created sand photo is my favorite here! Such fabulous lines Mother Nature created! Cute Halloween sketch! I love, love, LOVE that macro of the sand! I love the pumpkins on the fence! I really like the fractal form of this picture. Wonderful. I too appreciate May Sarton, especially her lessons on living well alone. And this week your macro thumbnail was intriguing. 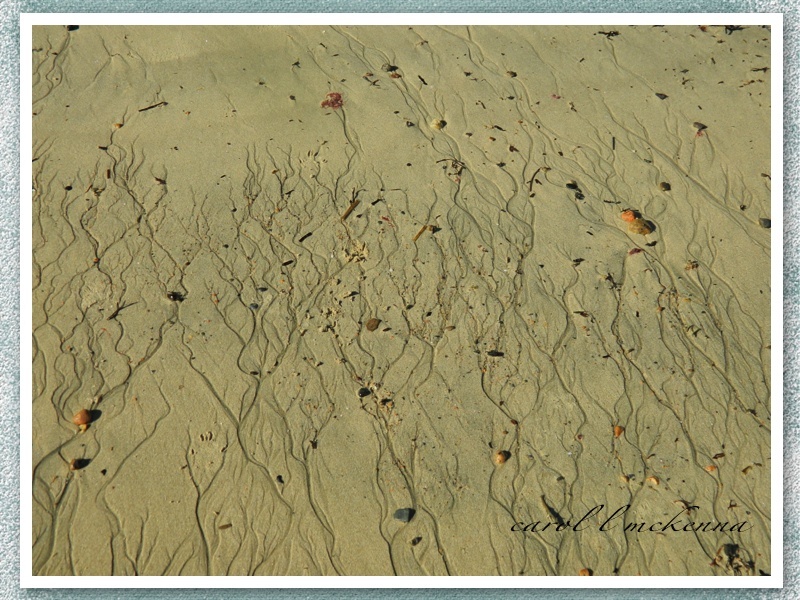 I was surprised that this lovely design had been created in the sand by mother nature--it does look like spare tree branches. Your Halloween sketch is so joyful. Enjoy the last of fall color but luckily as the seasons move forward there's always beauty. 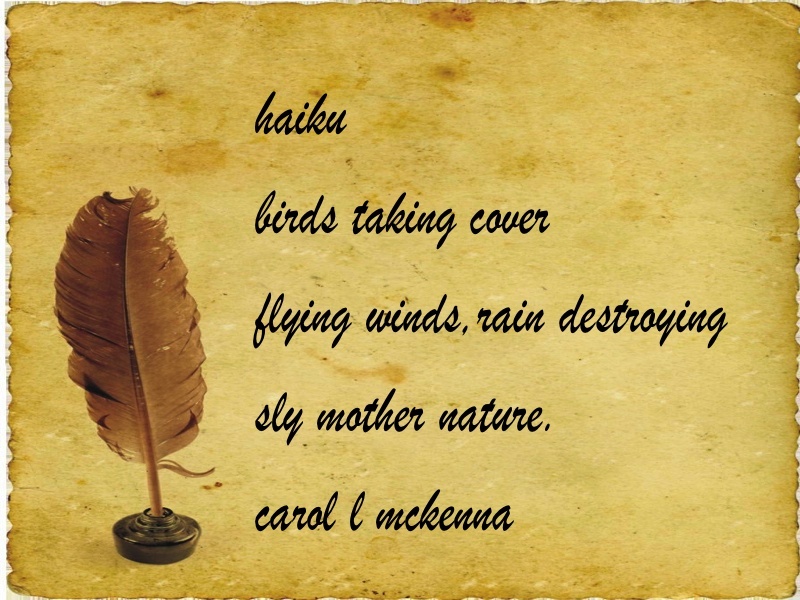 Hi Carol, Is your haiku about the brewing storm in the US? I hope that it won't be as bad as predicted. I am the bearer of good news (I hope so anyway! )- you won an ATC from me. Please send your email address to patsy.paterno (at) gmail.com so I can send it off to you! Nature is amazing and surprising, love autumn ocean view! Stay safe on the east coast! So poignant and serene. 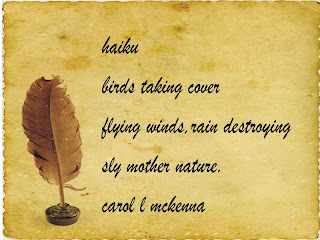 Beautiful pics and wonderful haiku, Carol! That ocean/sand photo is really neat! have a great day! Great pictures. At first I thought the sand picture was one someone had actually drawn. The Halloween sketch is so cute and your macro very special ! Love the macro beach photo from 'sly mother nature.' I too am watching as all the leaves blow away in the storm. Be safe. Cool beach shot. It really does look like trees after the winds have blown all the leaves of the trees. Stay dry and warm-hearted through the storms. Beautiful, I love the patterns in the sand. I hope you and Art take cover too. We don't need to see you flying down the coast! Stay well! Lovely photos and cute Halloween sketch. Great photos. The autumn color are especially beautiful. Beautiful captures as always and wonderful words as well!! The storm is so scary and I do hold good thoughts for all living in those areas most vulnerable! Take care, Carol! Great impressions of your environment. Miss autumn much. Please have a good Tuesday. Beautiful Fall Beach Pics! Love that sand art pic! Lovely verses! Beautiful shots. I hope you stay safe in the storm. I very much hope you stay safe and warm in the storm! Your pictures are beautiful, I am especially moved by the third one, it's just so lovely! Good luck through the storm - my father lives on Long Island and they just had a tree go through their roof. Hi there (again) - hope you have battened down the hatches and come through the storm OK - images on the wed look remarkable. What beautiful shots! Hope you're staying safe and dry. Hi, Carol. Hope danger is already over. A very appropriate haiku for the time being; sly mother nature, yes... sometimes a cruel stepmother more than a tender mom. Hope you still have some beautiful trees after the storm. Your haiku expresses the uncoming storm really well. Stay safe! Carol, lovely scenes and photos. And I really like your haiku, I am hoping the birds all survived our storm. Thanks for sharing your world! Hope y'all are damage-free. Stay safe! 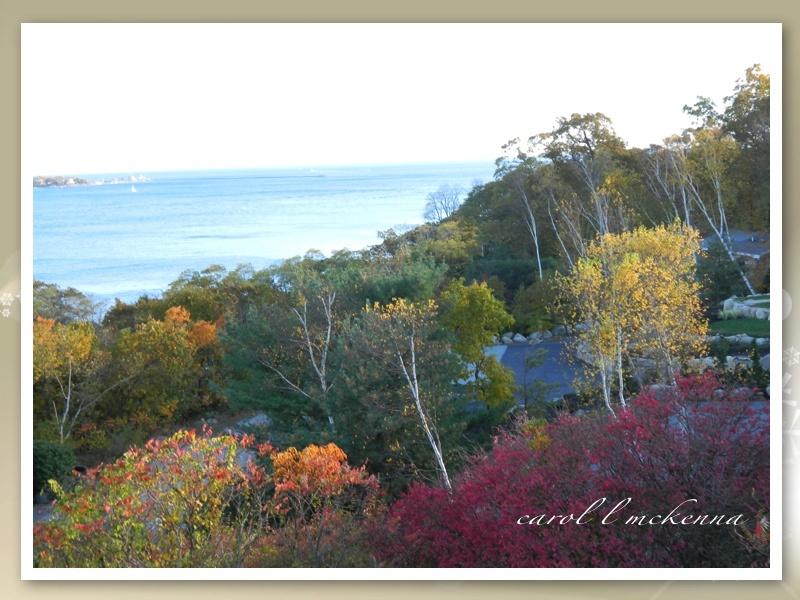 Wonderful views of the ocean trough the colorful trees. Your "Autumnal Ocean and Trees" picture is beautiful. And I hope you weathered the storm!